A mooted $27 bln listing of the mobile unit is key to Masayoshi Son’s vision for the Japanese group but problems are piling up for what could be the world’s biggest IPO. A new rival, high phone fees, and links to Riyadh could all prevent Son dialling up a premium reception. The UK startup won a million customers with next-to-no marketing, but keeps most funds at the central bank. CEO Tom Blomfield hopes to make money by selling other companies’ products, like insurance or mortgages, in return for a small fee. The numbers at least work on paper. The French investment bank may merge its small payments arm with $4.5 bln compatriot Ingenico. That could help its lowly valuation since the sector is rated more highly by investors. Yet struggling Ingenico, whose shares have plummeted on growth concerns, looks an odd partner. Hillhouse has raised over $10 bln for its latest private equity fund, Asia’s largest. It will invest in mature companies and startups, an unusual strategy but suitable for a region where buyouts are scant. Zhang Lei’s returns validate a model rivals are adopting. Investors are fleeing the country's $200 bln peer-to-peer lending sector, as Beijing steps up its crackdown. The squeeze has pushed many outfits like LexinFintech to seek more funding from banks. Margins will suffer, but it's a small price to pay for growth. As China’s takeaway-to-taxis unicorn seeks up to a $55 bln valuation, former investor Alibaba is intensifying the rivalry. It began a loyalty plan to get customers spending more and brought in SoftBank to back its Ele.me delivery service. Bad blood should be priced into the deal. The $85 bln Chinese search giant delivered 45 pct earnings growth last quarter, having shed a few distractions. The market is still cautious on Robin Li’s big AI plan as economic headwinds loom. But applying machine learning to content delivery - and censorship – should pay off. Pete Sweeney hits the RISE tech conference in Hong Kong and hears pitches on vegan cryptocurrency, fog computing and big data for shrimp farmers. Trade tensions haven’t dented enthusiasm, but venture capitalists expect a correction to flush the dumb money from the market. The e-commerce firm is raising new funds from outside investors for its meal delivery arm Ele.me, media reports. This comes just three months after Alibaba took full control of the unit. Rival Meituan's mooted $4 bln Hong Kong flotation might be giving Jack Ma stomach jitters. 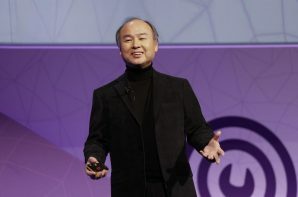 Masayoshi Son’s sprawling operation attracted an investment of over $1 bln from hedge fund Tiger Global. That should help SoftBank narrow its conglomerate discount, as might spinning off the Japanese mobile unit. The massive Vision Fund, though, is a murky hodgepodge unto itself. Viewsroom: Is Silicon Valley getting nervous yet? The tech hub is getting squeezed by new policy restrictions amid a looming trade war between the U.S. and China. How is the Valley holding up? Plus: India's state lenders are losing CEOs. Is running these banks into the ground part of the plan? Kabbage extends one-fifth of its small business loans at night or over the weekend. It’s no surprise such borrowers aren’t nine-to-fivers. But traditional lenders are. The ability of new entrants to transact 24/7 is just one more way technology is upending the industry. The $85 bln Chinese web giant has failed to impress with its repurchase plan. The amount wasn't big enough to excite investors and in any event, the search engine operator is supposed to be focused on turning into an AI champion. It has better things to do with the cash. Demand is rising for remote data services across the region, including from proliferating startups. Chinese vendors such as Alibaba are best placed to challenge the likes of Amazon. Beijing's push for "internet sovereignty," though, may impede expansion, even by local champions. A mooted private fundraising of more than $1 bln makes sense. With regulatory change coming to peer-to-peer lenders, floating now could upset Beijing, and might only be doable at a bargain price. Abundant venture capital offers a way to keep growing without a distracting IPO. Sina plans a secondary listing in the city, under new rules welcoming Chinese tech outfits traded overseas. In New York, the $7 bln web portal and its peers can issue super-voting stock on a whim and skip annual general meetings. The Fragrant Harbour will be less soft. A British parliamentary committee has called for the bank's boss to be fired, after protracted IT problems. The move risks undermining separate investigations by regulators. Removing Paul Pester now wouldn’t help TSB customers, and could even make the situation worse. The Chinese fintech group’s eye-popping funding round cements a $150 bln valuation. Ant raised nearly as much as Facebook and GM did in their IPOs, even as tech valuations cool and regulatory risks loom over Jack Ma’s firm. As insiders pile in, public investors may get squeezed. The Alibaba-linked outfit is pitching itself as more tech than fin to secure a $150 bln valuation. With over 600 mln users relying on it for payments, wealth management and loans, though, Ant is part of the fabric of Chinese finance. Beijing would be wise to regulate accordingly.